When the residents of a Highland care home discover that fees are about to rise substantially, they know drastic action is called for. Dorothy is not alone in having to raise money or face leaving her dear friends behind forever. In protest, residents barricade themselves into the lounge. When their rebellion fails, the worldly-wise Joan suggests setting up a chat line for men who want to speak to older women ‘in a particular way’! The scene is set for a hilarious series of events that just get increasingly out of control. ‘This book has to be my favourite comedy novel of the year.’ Susan Hampson. ‘What a great story. It made me laugh and cry. Hope that if I end up in a home it’s one like We Care for You.’ Elizabeth Wilson. ‘Excellent book had me laughing out loud at times and crying at others. Well written and will definitely be looking out for more from this author.’ Treeny. ‘An amazing book, illustrating how generations can learn from each other. I laughed and cried whilst reading this story.’ Funky Granny. ‘Just beautiful. This book has made me cry and laugh out loud throughout.’ S M Clement. ‘This is a novel that may never have been written but for a chance email I sent to the managing director of Black & White Publishing concerning my stage play of the same name, which toured during the autumn of 2015. Campbell wished me luck with the tour and made the comment that this would be a great idea for a novel. I hadn’t considered it, but as soon as I read those words it was obvious to me that he was right. Casting Off (2016) was published by Black & White Publishing and is available in paperback (£7.99) – ISBN: 978-1785300578 – from any high street bookshop, while the paperback/ebook can be ordered from Amazon. The title has also been produced in large print by F. A. Thorpe (Publishing) – ISBN: 978-1-4448-3288-4. 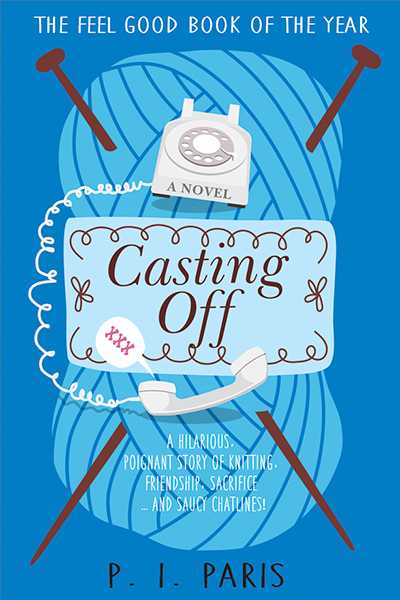 A German version of Casting Off is available in paperback – ISBN: 978-3-86612-440-0 – and ebook from the publisher Piper Verlag under the title Wer früher geht, verpasst den Schluss. Below is the link to the book on Amazon. An unabridged audio CD version of Wer früher geht, verpasst den Schluss has been produced in German by Audio Media Verlag. ISBN: 978-3963980213. You can listen to an extract at the above link. A Norwegian version of Casting Off is available in hardback – ISBN: 978-82-02-55826-0 – and ebook from the Norwegian publisher Cappelen Damm. The title has been changed to Perler på en snor. Below is the link to the book on the publisher’s website.